This Thursday’s Winter Quads was filled with drama as CCFC instructors Ian Harris and David Childs participated in a quad with college student Garrett Browning and expert Alex Eydelman. The fireworks began as early as round one when Browning upset Eydelman in a fantastically complicated game! Browning next faced NM Ian Harris but mixed up his opening moves. This allowed Harris to seize material and the initiative early on and Browning was unable to recover. In the final round Childs looked to get his first win of the tournament against Browning. Although down a piece he created some very threatening challenges for his opponent to figure out and nearly created a successful attack. However, Browning defended well and converted the win. Meanwhile, Harris was out for revenge against Eydelman after losing to him during their previous encounter. 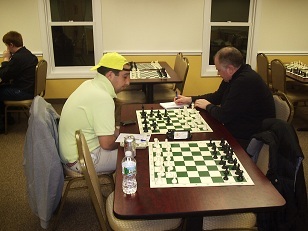 Eydelman managed to net a pawn after some opening complications but Harris was able to create some long term positional weaknesses which eventually cost Eydelman the game. Thus Harris squeaked by and won the tournament with 3/3!